Kids can say the darnedest things. As we saw a last week with Jonathan's Grade 6 kid, they can ask humorously ignorant questions or be brutally honest. Recently, I was reading through a book with a bunch of Grade 3 kids and it asked a question that read, "Have you ever eaten a cookie that looked really good but tasted really bad?" One girl took barely two seconds to which she smiled and said, "Yep! It was from my mom." I was a bit more shocked that she would say it straight out while all the other kids burst into laughter. Trying to give the mom some credit, I asked her if this was the first time she had made cookies before and she shook her head to indicate otherwise. It turns out the real reason for this was because she forgot to put any sugar in the cookies, which would obviously affect the taste as well as its texture. To be fair, I think I too have had my share of good-looking and bad-tasting experiences with food, though more recently it has been the things coming out of my kitchen, haha. Similarly, I think we have seen products come through here that looked amazing to the eye but fell short of its full potential. That is not to say all of our good looking products are like this, but it does happen. Today, we have a new mouse on hand in the form of the ROCCAT Kone AIMO. Equipped with ROCCAT's "intelligent lighting system", I think this mouse looks great to the eyes. However, how does it perform in real life? Will it stand up in our performance testing or crumble like the aforementioned cookie? Let us find out the answers to these questions and more! 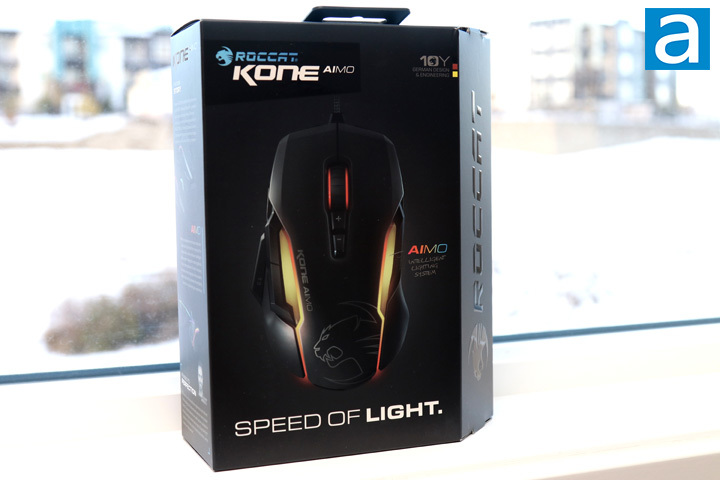 Today's review unit of the ROCCAT Kone AIMO arrived from ROCCAT's offices in Cerritos, California. 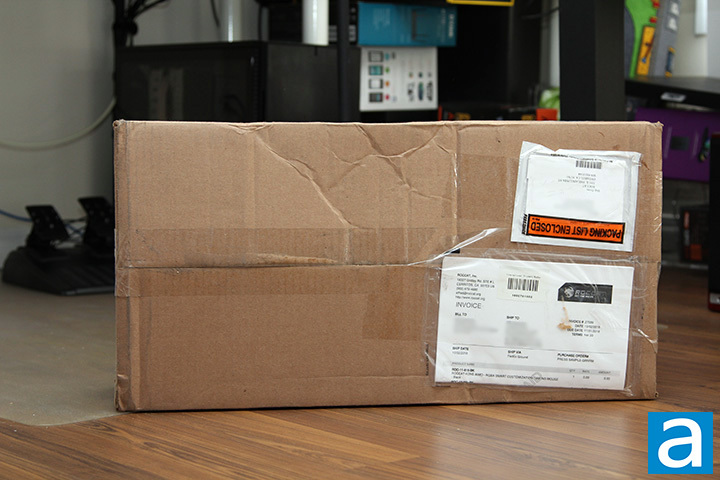 Traveling to us with FedEx and their ground service, this box arrived in average condition. The brown corrugated cardboard box did have several dents and showed signs of traveling fatigue, but thankfully it was intact and unopened. Along with the Kone AIMO, we also received the Horde AIMO, which my colleague Ben Joubert looked at several weeks ago. Otherwise, there was nothing else in the box. 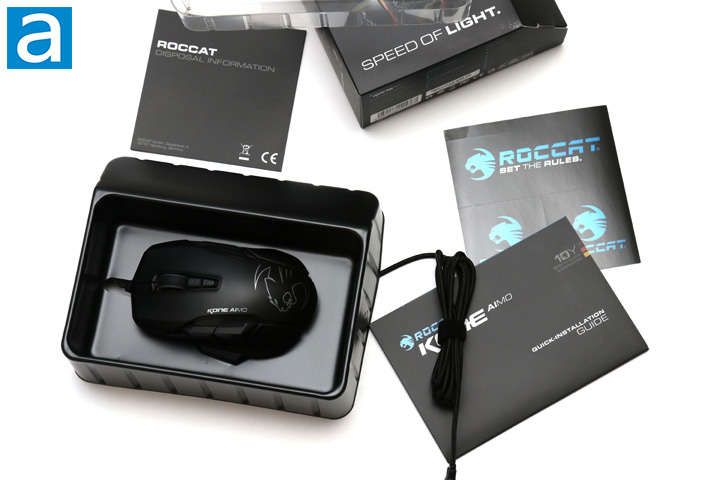 The ROCCAT Kone AIMO is packaged in a retail container that looks pretty similar to other ones from ROCCAT. The front shows off the Kone AIMO, illuminated on both sides in its RGB glory. We will cover these features later on. Otherwise, the top shows the product name, while the bottom has a tagline printed of "Speed of Light". Obviously, the mouse does not actually track if it moved at the speed of light, though I doubt many mice are capable of doing so. Down the right side of the box is a ROCCAT logo completed in a glossy finish for a nice look. Flipping to the back, we can get some more features that are found with the ROCCAT Kone AIMO. I like the retail containers from ROCCAT, but they are also quite busy with lots of words. However, no one really cares about this in a review, so let us move on. On an aside, I normally do not care much about the format of the specifications from the website, but the inconsistency and seemingly random case changing has made it hard to ignore. Moving on, inside the box we get similar goodies we have seen from other ROCCAT devices. Obviously, we have the mouse in question, the Kone AIMO, held in a plastic shell. We also have quite a few pieces of documentation, outlining the installation instructions and disposal information. Finally, ROCCAT has provided with some of their stickers, which look pretty nice. We have covered in the past that ROCCAT has a decent presence in the gaming community. It is a bit sad to hear Team ROCCAT is no longer part of League of Legends, but hopefully we will see more in the future. posted 2 hours and 30 minutes ago, with 5 posts. posted 2 hours and 53 minutes ago, with 4 posts. posted 8 hours and 21 minutes ago, with 4 posts. posted 15 hours and 36 minutes ago, with 12 posts. posted 15 hours and 36 minutes ago, with 9 posts. posted 15 hours and 40 minutes ago, with 11 posts. posted 15 hours and 40 minutes ago, with 56 posts. posted 15 hours and 41 minutes ago, with 11 posts.